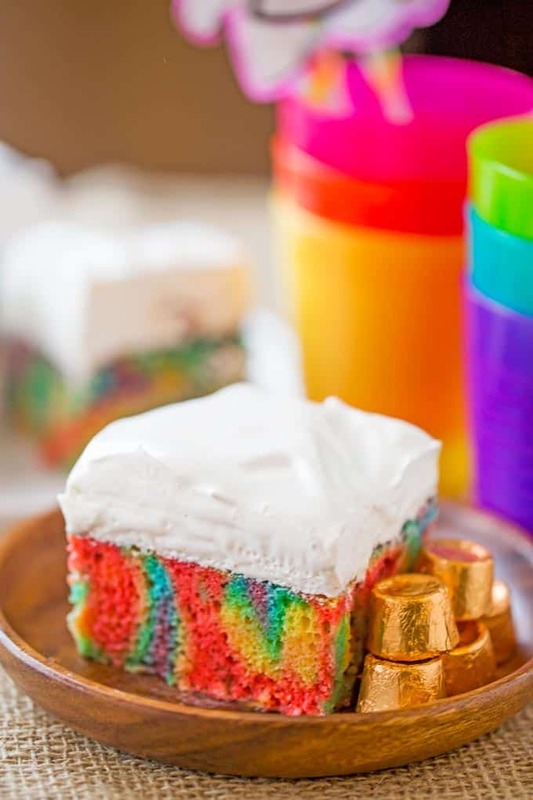 Rainbow Poke Cake With Whipped Cream made with no cake mix. Condensed milk makes this poke cake super moist and fluffy stabilized whipped cream won’t melt! 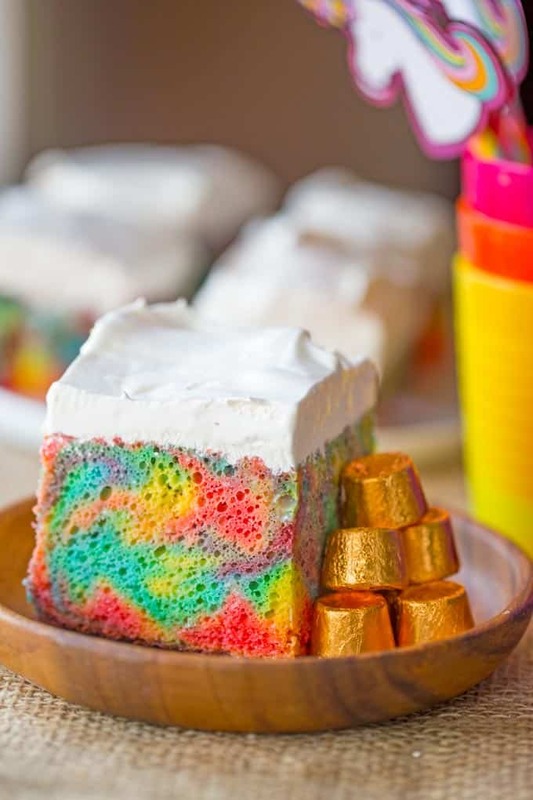 Rainbow Poke Cake With Whipped Cream is just about the happiest sheet cake you’ll ever make in your life. And with a deliciously fluffy whipped cream topping and super moist cake (I’m looking at you delicious sweetened condensed milk) you’re going to be the hit of your St. Patrick’s Day party. 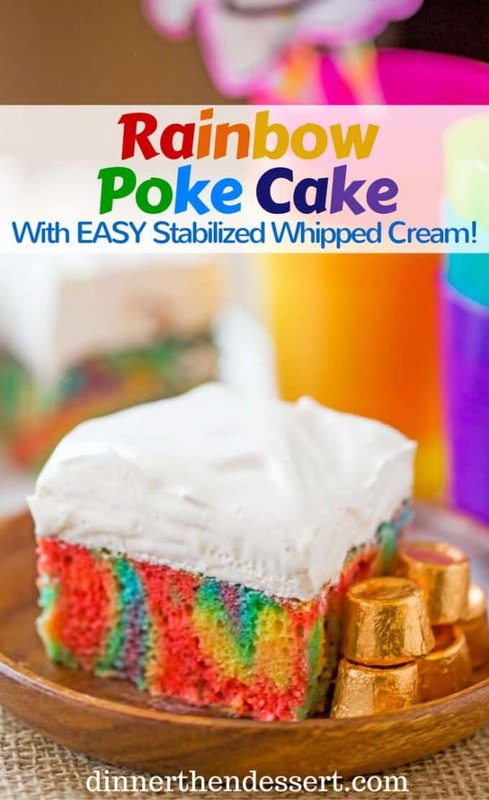 Rainbow Poke Cake With Whipped Cream combines all the delightful parts of the epic 6 layer rainbow cake we have all seen on Pinterest (Follow me on Pinterest, I always pin a lot of delicious recipes) with the delightfully lazy demeanor of a sheet cake. Yes, the colors are going to be a bit mixed up a bit, there is really no way to prevent the layers from baking into each other, but the results are still gorgeous! The stabilized whipped cream on top is also a total delight. With all the light fluffy flavors of whipped cream and none of the immediate melting you get with standard whipped cream you’ll enjoy the light topping on the super moist cake with that condensed milk soaked in it. Oh yes, the condensed milk. It’s like a secret you want to share with everybody when they say “WOW this is so moist! HOW? 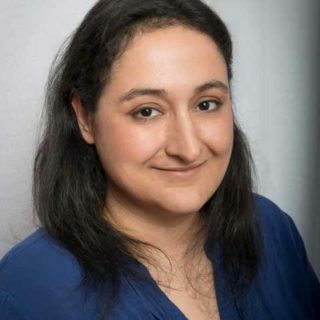 !” It kicks the cake up a notch with just a couple minutes of effort. The other part of this recipe that I adore is how easy it is in spite of the lack of cake mix (the cake recipe is the same as my popular Rainbow Cupcakes). The batter is a delicious white vanilla cake base with gel food coloring to brighten things up and the cloud-like whipped cream topping is easy to make. Ziploc bags! I pipe them into the cake pan with ziploc bags to make life SO much easier than spooning and spreading each layer. Clear vanilla keeps your stabilized whipped a bright white. Don’t overbake, you don’t want the top of the cake to turn brown. Use Gel food colors, this helps ensure really bright, playful colors. Clear Vanilla: This will ensure your whipped cream stays as white as a fluffy cloud. Knox Gelatin: This will stabilize your whipped cream so it doesn’t melt into a puddle in minutes after you take it out of the fridge. 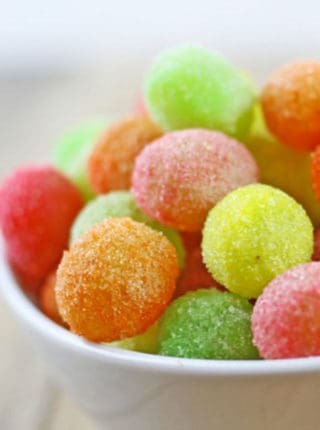 Gel Food Colors: Doesn’t add as much moisture as the drops do and the colors are significantly more bright and vibrant. Baking Pan: This pan helps ensure straight, tall edges for every piece to come out equally beautiful. Stand Mixer: My love, this gorgeous stand mixer is part of team Dinner, then Dessert thanks to an awesome Bob’s Red Mill contest and the color makes me smile! Ziploc Bags: I use this when piping different colored batter instead of piping bags because they cost so much less and I don’t end up washing pastry tips. Win win. 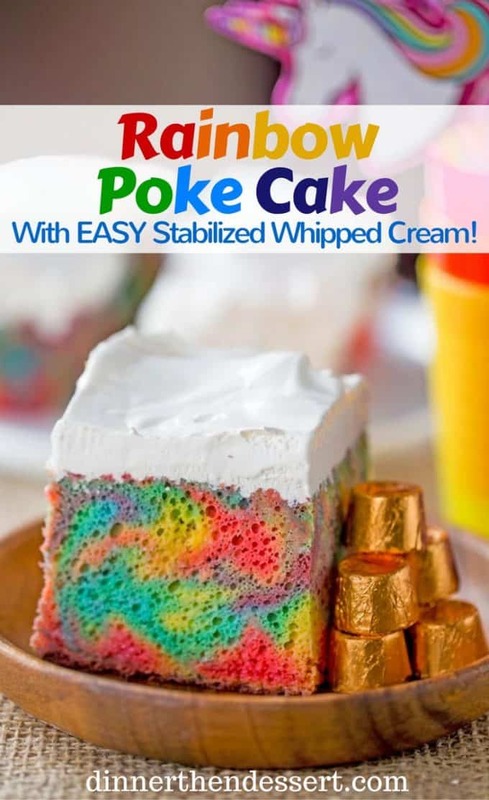 Rainbow Poke Cake With Whipped Cream made with no cake mix. Condensed milk makes this poke cake super moist and fluffy stabilized whipped cream won't melt! Add one cup of the batter to 6 different bowls. Color each bowl with your gel food coloring in red, orange, yellow, green, blue and purple. Mix until the colors are fully combined. Your choice here: Spoon or ziploc bags. 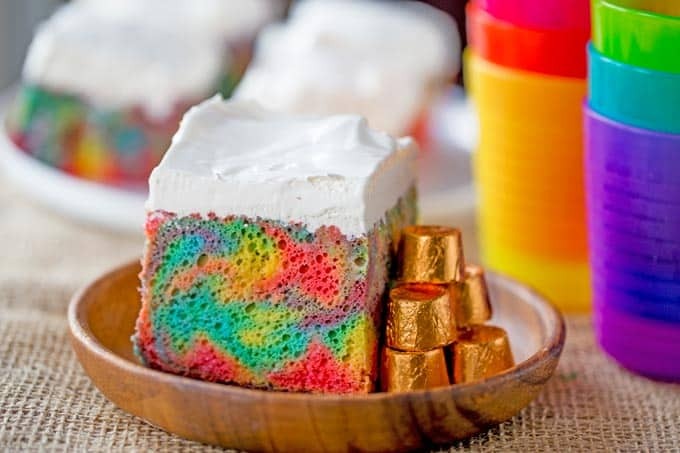 Either add the batter to 6 sandwich size ziploc bags and pipe just enough to make a thin layer of each color OR with a small spoon, spoon a layer. Start with purple, then blue, then green, then yellow, then orange and finally red. Bake for 30-35 minutes or until the middle of the cake is fully baked and let cool on a rack. Poke holes on the top of the cake, I do about 25 of them. Pour the condensed milk over the holes. Add the gelatin to your cold water in a small bowl and mix. Let it sit, to bloom, for five minutes. In your stand mixer add the heavy cream, powdered sugar and clear vanilla. After the gelatin has set, put it in your microwave for 5-10 seconds to melt the gelatin. With your paddle attachment(I LOVE LOVE LOVE this one with a built in scrapefor a minute to start building the peaks of the whipped cream and giving the gelatin time to cool a bit. Add in the gelatin and continue beating until you have soft-stiff peaks (where the tip of the peak will still fall but it otherwise holds the same shape). Pour onto your cake and spread. Your frosting should be SUPER light and fluffy, just like a delicious bright white vanilla cloud if you used clear vanilla. 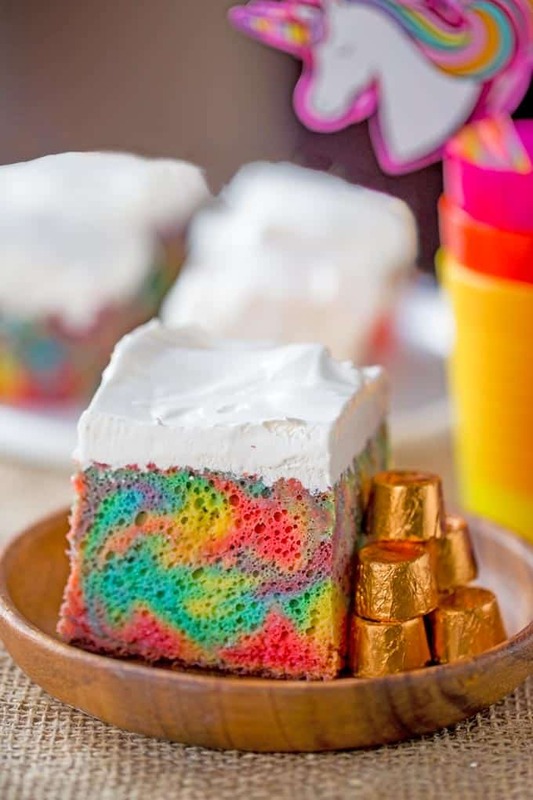 “Either add the batter to 6 sandwich size ziploc bags and pipe just enough to make a thin layer of each color OR with a small spoon, spoon just under a tablespoon of batter into each cup”. Is this recipe for cupcakes? I’m wanting to use a 9 x 13 cake pan for Easter. Should I just spread out a thin layer of each color, one on top of another? I don’t’ understand the comment about adding less than a tablespoon into each cup. Please explain. Thank you! 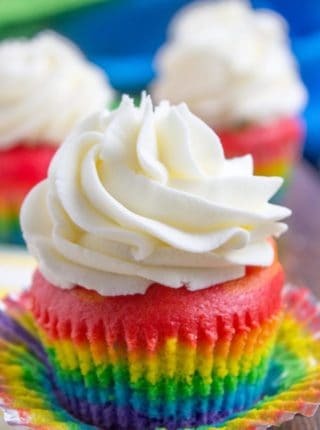 Sorry, I got confused as I have a rainbow cupcake recipe as well. Disregard. I want to make a 9″ x 13″ cake for Easter. In Line # 8 of your instructions, you mention putting just under a tablespoon of batter into each cup (?) Are you talking about making cupcakes instead of a cake pan? 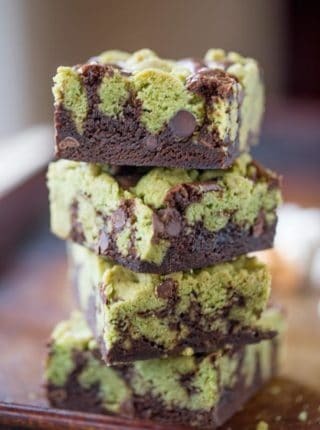 If so, would I need to pour 6 separate layers in a regular 9 x 13 cake pan? Sorry, but I’m a little confused about how to proceed after mixing up the six different colors. Thank you! So sorry for the confusion. I have a recipe for rainbow cupcakes too and I think that bit got added into this one by accident. For the layers, you can either use the ziplock bag tip or spoon it over as a layer. You’ll end up with 6 layers in the pan. I hope you enjoy it! 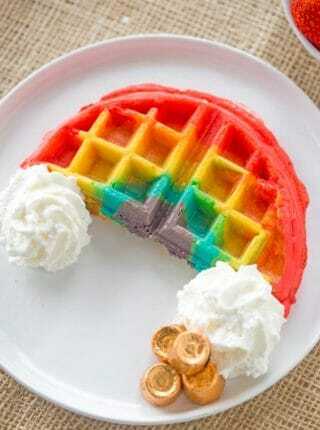 I want to make this for Easter. What size pan should I use? Thanks! This would be perfect for Easter!! I used a 9×13 rectangle bake pan. Enjoy! How long will this cake last? I was planning on making it the night before the party. Also will I be able to plate the cake or will it need to be left in the pan? 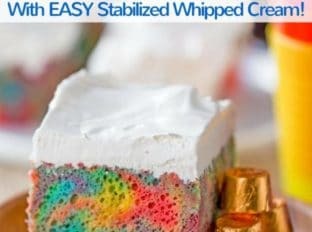 I completely understand wanting to have everything prepared before but with this cake, I would suggest making the cake before but adding the whipped cream topping the day of. As long as the room isn’t too hot, the cake can be plated just fine. It’s so pretty sliced and ready to enjoy! I can think of at least a dozen kids who would love to have this cake for their birthdays. Fun idea! 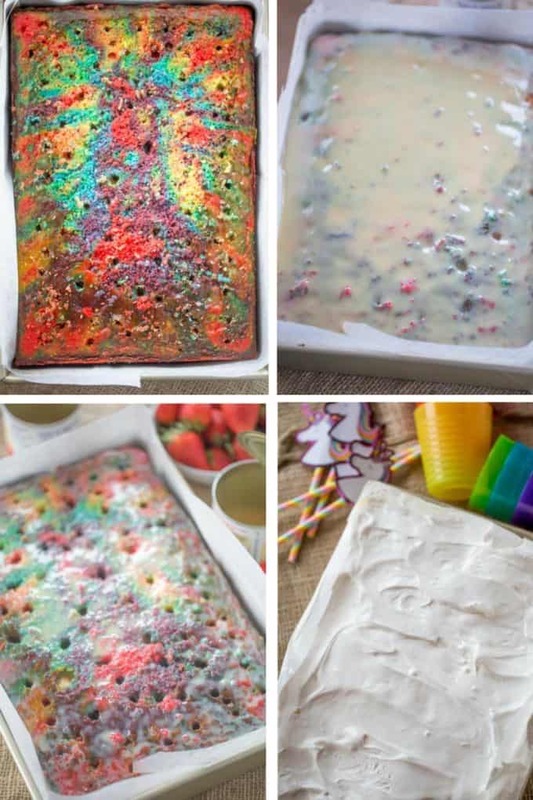 This Rainbow Poke Cake with Whipped Cream is so pretty! The texture of this cake looks perfect! This cake looks delicious and I see the instructions, but there is no list of ingredients! m I missing something here? Thank you for catching that, so sorry. My recipe plug in has been so glitchy. I fixed it and the ingredient list shows now. This is like a kid’s dream cake!! Of course my kids love it to someone good?? What a gorgeous cake! My girls would love to help me make this! First: awesome cake! So fun and like you said, perfect for St. Patrick’s Day (or any fun event)! Second: I’m so glad to learn how to make this whipped cream stabilized! I had no idea, and how easy! Thanks! !